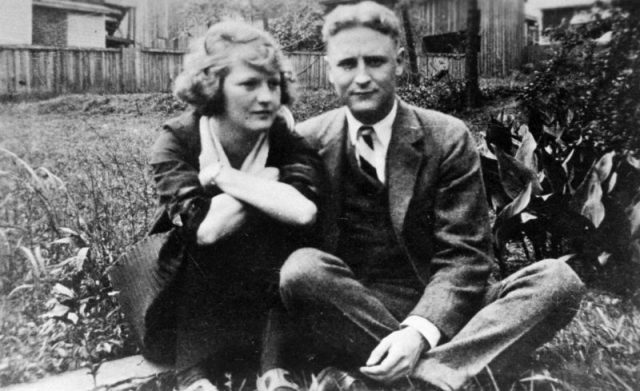 Zelda and Scott F. Fitzgerald were the brand new couple of the Jazz Age in America. They were restless, bright, fun, rich, intelligent, and itinerant. All together, they were the “roaring couple ” the symbol of modern America in the 1920s. They were so in love with their lifestyle that they continually sought to recreate their experiences through art, ultimately in their published novels, using personal diaries, photographs, and letters. They were the riders of a storm in which they both drowned. 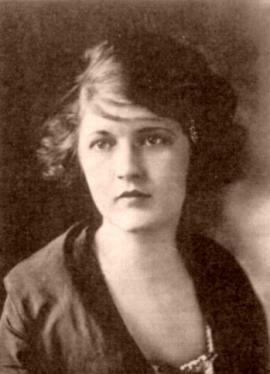 Zelda Fitzgerald, the original wild child who danced on table tops, rode on the roofs of New York cabs, and dived naked into fountains, was dubbed as “the first American flapper” by her husband, Scott. Born in 1900 in Montgomery, Alabama, Zelda was known as fearless, daring, disobedient and restless since she was a teenager. She drank alcohol, smoked, and snuck out of her parent’s house to have fun with boys. She did everything that was scandalous for a woman at the time. But nobody had the power to discipline her carefree spirit. Zelda Sayre at 19, in dance costume. Zelda was the youngest daughter of Alabama Supreme Court Justice Anthony Sayre and Minnie Machen Sayre. In 1918, at a party, she met Scott, a young lieutenant from Princeton University who was stationed at a nearby military base. Zelda, barely 18 at the time, revealed her love interest to her family but they advised her against it. While Scott waited to be shipped to France to take his place on the battlefields of WWI, fueled by the notion that he might not come home alive, Scott began writing his first novel. Luckily for Second Lieutenant Fitzgerald, the November 2018 armistice was signed before his unit was deployed. His novel, The Romantic Egotist, was never published in it’s original format but after the war left for New York and reworked it to produce his debut smash hit, This Side of Paradise. It brought him a wealth and great fame. So, 19-year-old Zelda left her home in Alabama and married Scott. 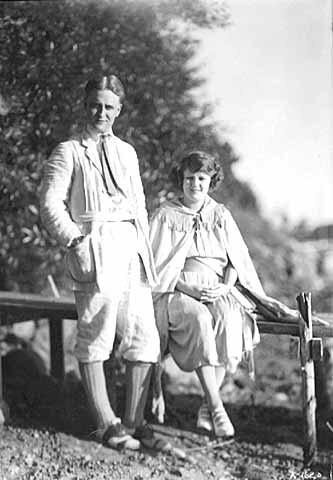 F. Scott Fitzgerald and wife Zelda, September 1921. 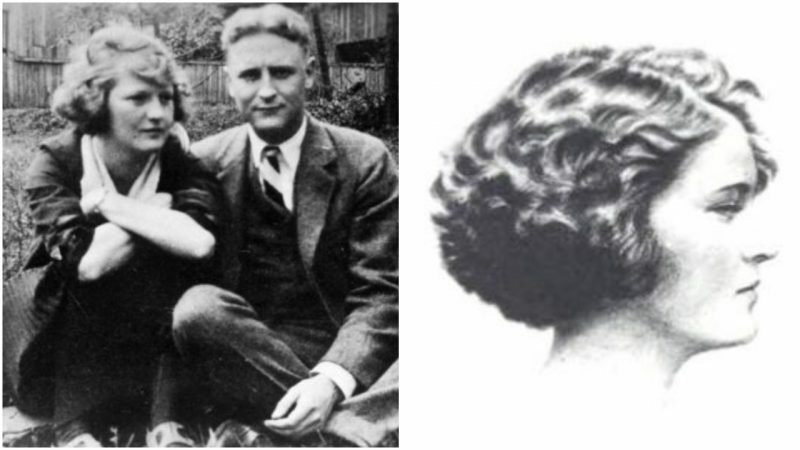 In 1921 they had their first and only child, Frances Scott Fitzgerald. However, neither Scott nor Zelda had a domestic streak, instead, they hired a nanny to take care of their daughter. They were both young, beautiful, in love, innovative, full of life, and everybody wanted to meet them. Scott’s fame opened the doors to New York high society where they were welcomed and embraced. Zelda always wanted to be center of attention, and it wasn’t hard at all. She was enchanting, always surprising, witty, and funny. There was no good party without Zelda. 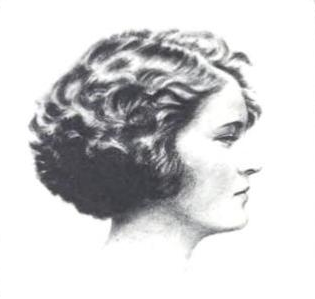 The 1920s were the good years, the great age where the Fitzgeralds thrived. But as much as their relationship was filled with love, mutual inspiration and ecstasy, slowly it turned into a toxic one filled with jealousy, infidelity, and accusations. While Scott was an accomplished writer, Zelda remained his muse and source of inspiration for his works. And she had the potential of becoming more, much more than a wild child, flapper, and inspiration for other artists, maybe more than her husband. She began having nervous breakdowns and by 1930 was admitted to a mental hospital. Although diagnosed with schizophrenia at the time, what she suffered from were fluctuations between depression and mania which today is the diagnosis of bipolar disorder. Between 1930 and 1940, Zelda spent most of her time in and out of hospitals. In 1932, while being treated in John Hopkins Hospital in Baltimore, Zelda had a creative outburst. She kept herself occupied with painting and writing throughout the whole time she spent in hospitals, but this time she managed to write and publish her first and only book, Save me the Waltz. At the time, the book wasn’t very successful. It sold very few copies and received harsh critique. The worst part was that her husband publicly accused Zelda of plagiarism and undermined her literary skills as third-rate. 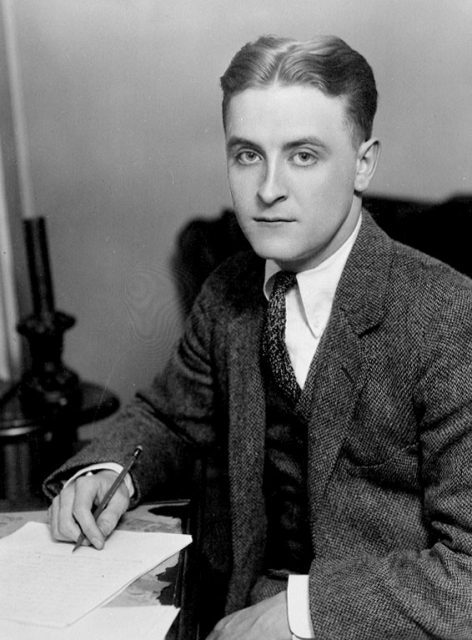 Even though he portrayed their private lives in all his work, Scott accused Zelda of using autobiographical details of their lives which he had wanted to use in his novel Tender is the Night. All that crushed Zelda’s spirit. The last time Zelda and Scott saw each other was during a trip to Cuba in 1938, which ended in disaster. 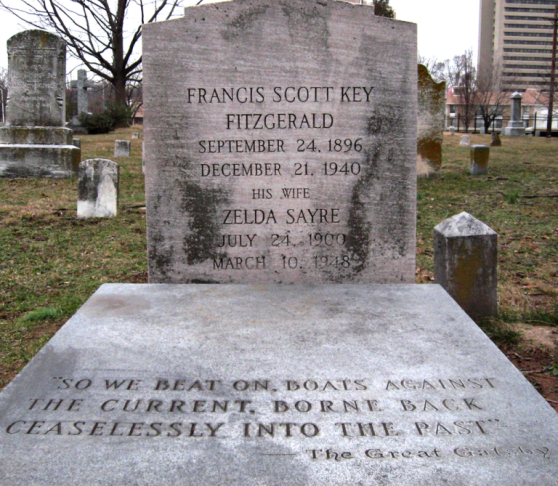 Zelda and Fitzgerald’s grave in Rockville, Maryland, inscribed with the final sentence of The Great Gatsby. Zelda continued to drift in and out of Highland Hospital in Asheville, North Carolina, never getting any better but still working on her novels. And it was here that she would meet her tragic end. On March 10, fire broke out in the hospital’s kitchen. It quickly spread via the dumbwaiter shaft to every floor of the wooden building, making rescue of those stuck inside an impossibility. Zelda was allegedly sedated and locked in her room that night but no-one will ever know for sure if this is true. She died in the fire along with eight other women. She was 47.